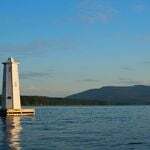 Whether you’re just the hiking-type or you’re looking for something active to do after a day of lazy indulgence on the lake – the Lake Sunapee Region offers a multitude of hiking opportunities for hikers of every ability level. 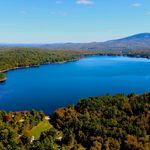 From short hikes and serene views to hidden lakes and long-distance challenges: The Sunapee Region has something for everyone. Did you know: The Sunapee lake region boasts six state parks? That means you can expect plenty of variety, clean facilities, helpful staff, and well-marked trails. These state parks include Cardigan, Rollins, Pillsbury, Wadleigh, and Winslow state parks (Visit their pages on NewHampshireStateParks.org for scheduling, events, precautions and more). Mt. Cardigan is well known for its great views due to a 3,121 foot summit that’s all granite, with hardly any tree-cover. 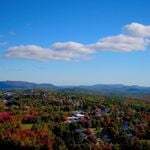 It’s panoramic view spans west-central New Hampshire, including vistas of Monadnock, the White Mountains, and views that stretch as far as Vermont and Maine. Use the West Ridge Trail with its log staircases and wooden bridges to snake your way up 1,200 vertical feet in 1.5 miles (Cardigans most direct route) for a classic New England hike shaded by yellow and white birch, maples, and beech trees. Adding distance to this hike can be easily done with a quick detour to the top of Firescrew Mountain via Mowgli’s trail (for an added couple miles). Great for: Families and more! For more experienced hikers, the east side of Mt. Cardigan is far more challenging. On this side of the mountain, you’ll find the American Mountain Club’s 1000 acre Cardigan Reservation (home to one of their amazing AMC Lodge’s) and a multitude of loop-options for longer day-hikes and even some over-night hiking opportunities. Many hikers and outdoor enthusiasts enjoy AMC’s Cardigan lodge to wake up at the foot of the mountain and get an early start exploring the park’s many, many acres. Learn more about staying at the AMC Cardigan lodge in the New Hampshite State Park’s blog. If you’re a family looking for a quick hike to stretch your legs, get some great photos, experience a nice view, or even enjoy a picnic – Mt. Kearsarge is always a great option. For an easier hike that’s only about ½ mile to the top (you read that right, you’ll be driving most of the way up) start at Rollins State Park. For a slightly harder hike (especially for little feet) take the 2.9 mile Winslow and Barlow Trail Loop. While both hikes are great family hikes, this trail – with steep sections and granite steps – is great for families with slightly longer legs and bigger feet! Mt. Sunapee, while popularly known for winter skiing, is also a local favorite when it comes to hiking, picnicking, and nature-watching. With multiple peaks, a remote lake, babbling brooks, thousands of acres, and wildlifem galore – Mt. 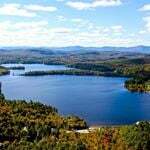 Sunapee offers the full New England hiking experience. Most hikes to the summit use the Summit Trail, or ski-trails. From the summit, you can reach a variety of additional trails (outlined below) as well as Lake Solitude -a true hidden gem in the Sunapee Region. Summit trail: The main hiking trail to the summit (as the name implies), this trail is a 2 mile hike straight to the summit after being joined by the Sunapee, Ragged, Kearsarge Greenway Trail at the ¼ mile mark. To keep on towards the summit, stay left at this point. Solitude Trail: The Solitude trail starts east of the summit, with a 1 mile hike to an overlook of Lake Solitude. From the overlook, all you have left is another .6 mile hike to the lake itself. Because the lake is an important habitat to some rare species, swimming is not permitted. Eagles Nest: A short trail off of a lower section of the Newbury Trail, Eagles Nest will give you a great view of Lake Sunapee and the Harbor in the village of Newbury. The Andrew Brook Trail: With a trailhead off of Mountain Road, south of Newbury Harbor on Route 103 – this 6.5 mile trail offers a quieter, more challenging approach to the summit. Rim Trail: A .9 mile trail connected to the base of the Sun-Bowl Chairlift that will take you to the mid-point of the Newbury Trail. Somewhat of a change of pace from your classic hiking trails, The Fells was originally the summer estate of John Hay – politician, statesman, and personal aid to Abraham Lincoln. Today, it is part historic estate, part nature conservatory. Established in 1987, the John Hay Refuge (across the street from the main Estate) was set aside for public use as a migratory bird sanctuary and wildlife reservation. To this day, when the Hay Forest Reservation and the Fells estates are combined, the two represent the longest stretch of undeveloped shoreline on Lake Sunapee, with a shorter hiking trails, expansive forests, a small meadow, and Minute Island (Offshore the mainland, naturally). The greenway takes hikers through forests, over mountains and down old roads long forgotten by cars and motorcycles. While overnight camping is prohibited, its network of trails can be used to put together a longer day hike or any number of quick excursions suitable for hikers of all ages and experience levels. An overview of the SRKG, a “Greenway” comprised of trails, pathways, and old-roadways encircling the Lake Sunapee region.